USC and Washington are investigating whether a football coach who worked under Steve Sarkisian at Washington violated NCAA rules by paying for private tutoring and online classes for a recruit. The allegations surround the recruitment of Andrew Basham, a former defensive lineman at Lynnwood High in Washington, who signed a letter of intent with the Huskies last February but did not qualify academically to enroll. Mike Davis, a throwing coach who helped Basham win a state shotput title, told The Times that Tosh Lupoi, Washington’s defensive line coach, gave him $3,000 to cover private tutoring for Basham through a test preparation company. Davis said he also received $1,500 from Lupoi to reimburse Basham’s father for online classes Andrew could use to raise his grade-point average. NCAA rules prohibit universities from paying for a prospect’s academic services. Head coaches are required to "promote an atmosphere of compliance" and are held responsible for the actions of assistant coaches and administrators who report, directly or indirectly, to them. Lupoi did not return phone calls seeking interview requests for this story. Informed by text message that there were allegations he delivered cash on at least two occasions to a go-between to reimburse expenses for tutoring and online classes for Basham, Lupoi said in a text, "Well that’s certainly false. I deny such allegations of violating NCAA rules w/ the recruitment of Andrew Basham." Lupoi, who played football at California from 2000 to 2005, joined Sarkisian’s Washington staff in 2012 after serving as Cal’s defensive line coach for four seasons and gaining a reputation as an effective recruiter. David Roberts, USC’s vice president for athletic compliance, said Lupoi was among the coaches Sarkisian listed as possible candidates to become Trojans assistants, and that all proposed candidates were vetted. USC’s compliance office began investigating Lupoi last week after receiving a tip from someone who said Davis had been the middleman in a transaction between Lupoi and a recruit. The Times received a similar tip. Roberts contacted Davis on Friday. After speaking with him and also with Sarkisian, Roberts said USC found no evidence that Sarkisian knew about the alleged activity. "We don’t have concerns about Steve’s involvement," Roberts said. 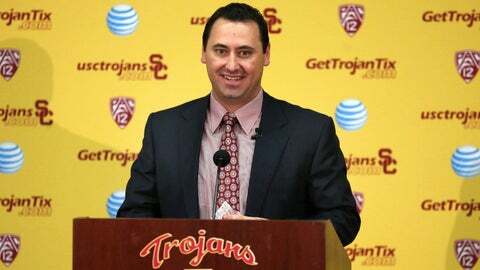 Sarkisian said he first learned of the situation when contacted by USC’s compliance office. "When I was at Washington I did everything within my power to make sure we were 100 percent compliant in all NCAA and Pac-12 rules, and I’m going to operate the exact same way here at USC," Sarkisian said. Asked if a head coach was responsible for everything in his program, Sarkisian said, "You do everything in your power to be proactive, to promote a compliant atmosphere." I don’t have the power to see everything, hear everything and know everything, but I do take responsibility for that, to promote that atmosphere." Sarkisian has hired three former Washington assistants – Johnny Nansen, Keith Heyward and Peter Sirmon, but is still in the process of assembling his USC staff.